This entry was posted in Campus Announcement, Community and tagged biology, College of Agriculture on February 11, 2014 by Wire Eagle. 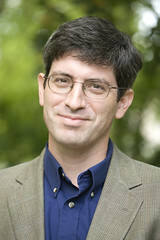 AUBURN UNIVERSITY – Critically acclaimed science writer and New York Times columnist Carl Zimmer will discuss “Of Frankenfoods and Superweeds: Reporting from the Front Lines of Biology,” in a public lecture at Auburn University Feb. 25.
Zimmer, who is also a blogger for National Geographic, will speak at 4 p.m. in Lowder Business Building, room 113-A, as part of the College of Agriculture’s E.T. York Distinguished Lecture Series and in conjunction with the university’s Littleton-Franklin Lecture Series. An author and Yale University lecturer in scientific writing, Zimmer is known for his ability to translate cutting-edge scientific developments into easily understood descriptions. His writings on topics ranging from viruses to evolution have been featured in The Wall Street Journal, National Geographic, Time magazine, Scientific American and other publications and have earned him awards from the National Academy of Sciences, the American Association for the Advancement of Science and numerous other organizations. Paul Patterson, College of Agriculture associate dean for instruction and chairman of the York Lecturer Series committee, said Zimmer’s presentation should appeal to a variety of audiences, including researchers. While at Auburn, Zimmer also will speak to campus communications professionals and agricultural communications students and will visit journalism and communication classes in the College of Liberal Arts. For more information on the Zimmer lecture, contact Megan Ross at mhr0001@auburn.edu. The E.T. York Distinguished Lecturer Series at Auburn University was established in the College of Agriculture in 1981 through an endowment from E.T. York and his wife, Vam Cardwell York, both native Alabamians and Auburn graduates. York, who died in April 2011, was head of the Alabama Cooperative Extension Service from 1959 until 1962 and had a long, successful career, retiring in 1980 as chancellor of the State University System of Florida.